Ever since making my own pesto, it’s like my new favourite thing! No.1 it only needs a handful of ingredients, sweet basil, pine nuts, garlic, olive oil and salt. No.2 It’s freezer friendly and it’s so easy whenever you want to make a quick dinner, toss in some of the pesto with some pasta. Tada!!. Or spread it on toasted baguette for light and quick snack. Pesto (Italian pronunciation: [?pesto], Genoese: [?pestu]) is a sauce originating in Genoa in the Liguria region of northern Italy (pesto alla genovese). The name is the contracted past participle of pestâ (“to pound, to crush”, from the same Latin root as the English word pestle), in reference to the sauce’s crushed herbs and garlic. 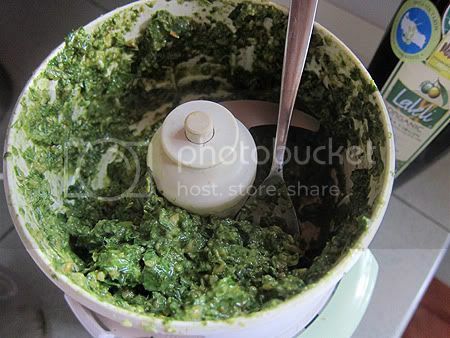 Pesto, can be made traditionally in a pestle and mortar. Pound everything together and swirl in olive oil. But well, I almost never use the pestle and mortar at home. I don’t know, it could be the recipes or the things that I cook that doesn’t need a pestle and mortar to do the job. Even for this, I used a trusty mini food processor, for things like paste. Trusty because it’s one of the longest lasting home appliance in the kitchen! For this, I don’t really have a recipe because it comes down to just eyeballing everything and tasting along the way. Lately I’ve been without recipes. Even in baking lol. Nothing too drastic but I think bread and butter pudding doesn’t really need to be so precise. 😉 Anyway.. 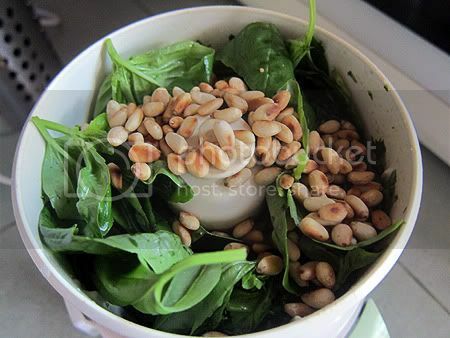 If using pestle and mortar, crush basil leaves, garlic and pine nuts till it’s creamy and mushy. Add in salt and drizzle in olive oil a little at a time. Crush till it’s creamy and spreadable. Keep in an air tight container, or use in your pasta / pizza dishes. Freezes well. Supper yum on pizzas ! Which kinda means, next post will be about pizzas! Swee San, this item has been on my to-do list for the longest time. And no problem about ‘no-recipe’ – the best measuring device is your tongue. I love pesto. It’s easy, delicious and healthy. Hi Ellie, yup!! much easier than the tomato based sauce ..
Oooo, Village Grocer has basil? Yay!